I really can't wait for the warmer weather to begin. Here's hoping featuring a hot spring/summer style will speed up the melting of the snow that still seems to be present in some areas (like my neighborhood). 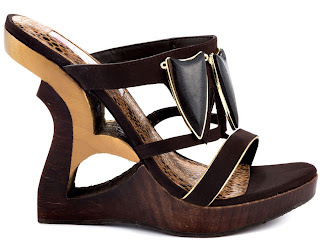 Highlight and celebrate your earthy side in this 2 Lips Too Native Wedge. This modern architectural 2 Lips Too silhouette features a brown faux leather upper with prominent stone details at the vamp, a curved cutout 5" wooden heel with the 1" platform for the perfect amount of height. Hopefully we get the opportunity to enjoy wearing this cool wedge very soon.